The only thing better than the spectacular Matthes Crest traverse is to link it up with two other classic Tuolumne cruiser routes, the NW Buttress of Tenaya Peak and the SE Buttress of Cathedral Peak. You also get a sampling of what Tuolumne has to offer, from smooth slabs to wildly exposed knobby fins to choose-your-own adventure crack climbing. 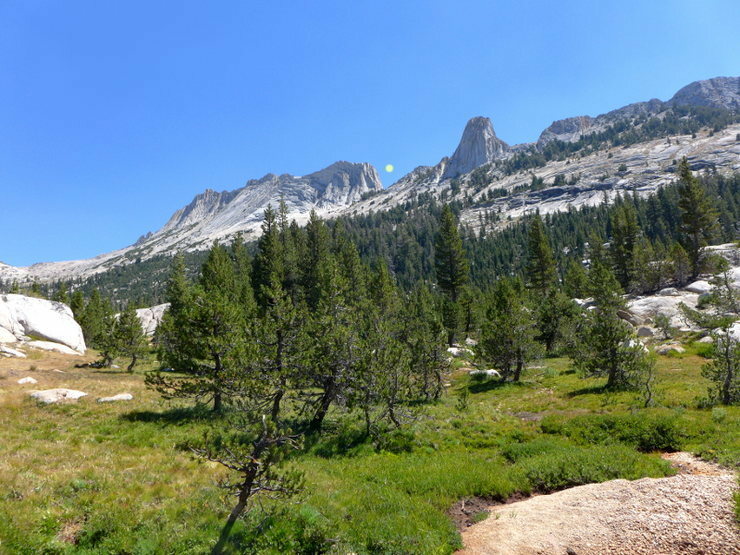 These three peaks form an obvious circuit from Tenaya Lake and make a great outing for any Tuolumne enthusiast. Many options exist for extending the link-up if you haven't gotten your fill. Note that this route holds snow so it's best to avoid it until dry. The route is shaded in the morning so plan accordingly. There isn't a direct trail from the Tenaya Lake parking lot so either take the trail to the lake until you find the one that heads back NE or trample the meadow and cross-country through the trees toward the left-hand side of Tenaya Peak. You are aiming for the shrubby ledge system to the left of the route. As of June 2012 the trail was well worn and cairned. Supertopo has a blow-by-blow description of the route, but you can just as easily follow the crack systems up the obvious buttress. The route eases you into the steeper, more difficult climbing up higher. Several summit options exist of varying difficulty, including a 5.7ish hand crack and a 4th class option out right. The true summit is southwest of where you'll top out. From the summit of Tenaya Peak head east between Tressider Peak and Columbia Finger then southeast after crossing the Cathedral Lakes trail to reach the southern end of Matthes Crest. You'll be able to see Cathedral from the Tenaya Peak summit as a bearing point. It's 2.5 miles as the crow flies and the only place you will likely follow a trail is the final ascent up to the notch that marks the start of Matthes. From the golden boulder choose a line up the knobby crack systems that lead to the ridgeline proper (5.5). The ridgeline is mostly class 3-4. If it seems too hard look off to the sides; there is usually an easier ramp down below. For soloists the easiest way off the south summit is to head back in the direction you came until you can downclimb to a tree on the east side of the can also do a more direct downclimb at 5.7. From here traverse north into the notch that divides the summits. From the notch mantle onto the ledges until you reach the leftward trending diagonal crack (5.7) which is the official crux of the route. Alternate: 5.8 corner offwidth From here climb the 5.4 chimney on the left side of the ledge to the north summit. Don't stop now. Continue on for more class 4 to low fifth class exposed fun. The final tower provides another short section of exposed 5.7 if you wish to partake. If not, you can downclimb off the west side (class 3-4) just prior to the second to the last tower. From the end of Matthes Crest work your to one side of or over Echo Peaks/Ridge to Cathedral's SE Buttress (~1.6 miles as the crow flies). The most direct route is to aim for notch between Echo Ridge and Echo Peaks (left side of Echo Ridge). There are multiple routes up the SE Buttress. Refer to Supertopo if you need specifics. The most recent edition now includes the full traverse. From the top of Cathedral downclimb the 4th class summit blocks to reach the class 3 ledge system. If you are heading back to the Cathedral Lakes trailhead you will want the high saddle to the NE that leads to the trail that skirts the east side of Cathedral Peak. If you are heading directly back to Tenaya Lake continue down slabs/scree and through swamplands to the southern side of the main Cathedral Lake. You'll find a footpath along the shoreline. From the western end of the lake follow the drainage down slabs and cobbled river beds toward Tenaya Lake. I did notice a faint trail in certain section of the drainage but I gave up trying to follow it since it didn't really seem to offer any advantage over going straight down the drainage. About 1.5 trail miles from the lake you'll come across a bridge that leads to a good trail back to the lake and your car. The direct line mileage for the entire descent is ~2.7. Availability of water will vary. In late season the seasonal streams between Tenaya and Matthes may dry up and require a detour to the lakes. The northern slopes below Echo Ridge/Peaks, however, tend to hold snow later and are a more reliable source. Worst case you can detour to one of the lakes. The route starts and ends at the Tenaya Lake parking lot just NE of the lake (bathrooms available). 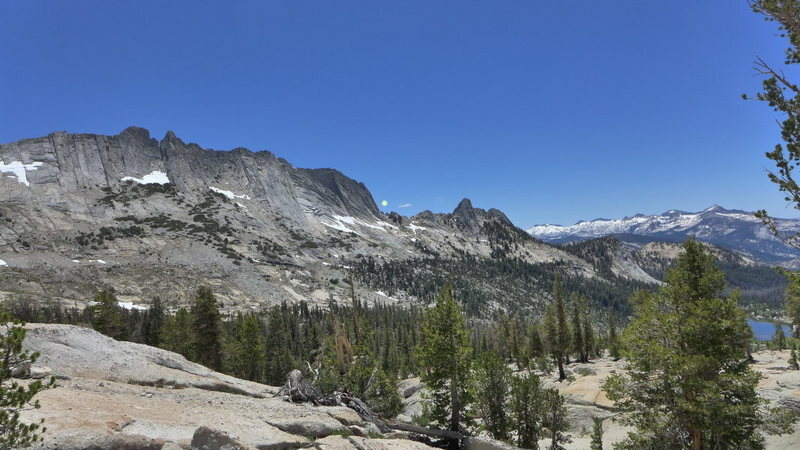 Alternatively, one could set up a car shuttle at the Cathedral Lakes trailhead or take the Tuolumne shuttle/hitch from here to lake, but then you would miss hiking the cool drainage below Cathedral Lake. Note that the shuttle was not running in 2018. If you plan on taking the Tuolumne shuttle check the NPS site first. The shuttle was not running in 2018, and its long-term status is uncertain. A lot of good info here . Another really fun day is to hike into Elizabeth Lake , the trailhead is in the back of the TM campground, and climb Unicorn (4th class) and then wander over to Cockscomb ( easy 5th ) and then onto the Northern end of Mathes Crest . From there you would climb North to South ,which some would consider 'backwards' , but who cares . Very worthwhile, after traversing to the N end of Matthes Crest, is to climb next the East arete of Echo Ridge. Its upper section is yet another knife edge ridge. Mostly class 3 moves but very sustained and exposed. For maximum fun, take it exactly on the top of the arete whereever possible: "balls over the razor". Or if hanging to the side, then switch sides frequently -- and look for chances to hang off the steeper side. (But I did bypass one high fin). After that, there is yet another knife-edge ridge connecting across Echo Peaks 1 + 2 + 3. (Peak 3 also happens to be the highest of the Echo Peaks). Easiest to access from the col between peaks 1 + 2, but likely there are more intereating ways on or off. (I'd give higher priority to the Echo Ridge traverse). Afterward a simple way to Cathedral Peak is to retrace track to Wilts Col. It is also possible to descend West side of col between Echo peaks 2 + 3, starts as fun scrambling, but lower gets into loose rock. Soloed this linkup today, my first time on any of these three peaks. Car to car in 6.5 hrs. I was hiking fast, but still taking rests here and there. For a soloist, 5-8 hours is a good window. Brought two liters of water and iodine tablets. I filled up water once at Echo Lake, but I also crossed a stream just after Tenaya and another near the bottom of Cathedral, both of which looked clear. Seems there is plenty of water to be had. Has anyone linked up Mt. Conness with the Triple Crown, a Quadruple Crown if you will?